Approximately 60 miles off the coast of Spain, Mallorca is the largest of the Balearic Islands, with some 310 miles of sparkling coastline. Because of its ideal climate and strategic location, the island has attracted a variety of outsiders over the years, enriching the island with Roman, Arab and European influences. 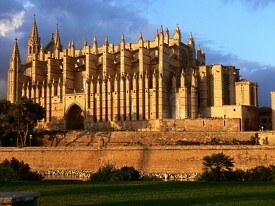 Passengers sailing into port will get an amazing view of the dramatic Gothic cathedral La Seu, set just above the harbor, and the hilltop Bellver Castle. Most excursions visit both of these sites as well as the Spanish Pueblo and the island's famous white-sand beaches. In valleys all along the coast, little fishing villages sit tucked away, with narrow winding lanes leading past cozy stone cottages and old Moorish estates. Also enjoy the breathtaking view of the Tramuntana range soaring majestically into the sky and countryside tours highlighting Valledemosa's monastery of La Cartuja.